The ArtShed becomes a piece of art! Local artist Samaira Ali paints the ArtShed on The Piazza to celebrate Autumn Arts Festival in Wimbledon and the launch of Merton Arts Trail! Samaira was born in Copenhagen, Denmark and is of Pakistani heritage. She studied Italian and History of Art at Copenhagen University and has lived in London since 2011. “With the benefit of an intercultural background, I have defined ways in which to combine different styles of art, creating new aesthetics, as well as forms of expression that lead the viewer to reflect and consider art in new and diverse ways. I constantly seek to expand my understanding of art in ways that go beyond just the aesthetic aspect and in my art, I strive to create works that invite dialogue and reflection. The ArtShed is part of Love Wimbledon’s Autumn Arts Festival, celebrating the Arts and Culture here in Wimbledon.Find out more about Autumn Arts here. https://lovewimbledon.org/wp-content/uploads/2017/02/LW-RGB-Web-1-300x212.gif 0 0 3milAdm1n https://lovewimbledon.org/wp-content/uploads/2017/02/LW-RGB-Web-1-300x212.gif 3milAdm1n2015-08-28 00:00:002017-04-13 13:53:44The ArtShed becomes a piece of art! Get Arty This Autumn! 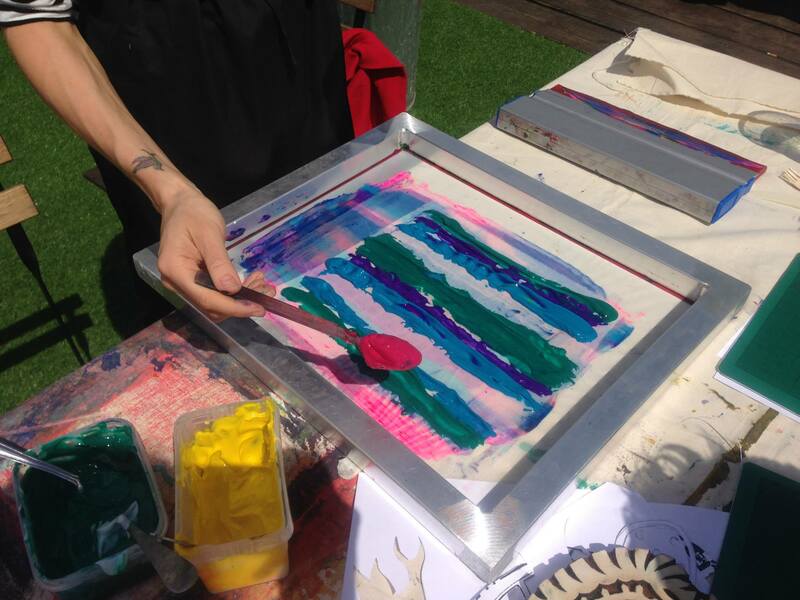 Three weekends of arty fun on The Piazza (outside Morrisons) 11am – 5pm. Meet the Merton Arts Trail team as they celebrate the launch of this year’s trail. Have a go at still life drawing and spot a famous artist popping up around town. Screen Printing with Nicole Line. Screen print your own hand cut stencils onto fabric. Bring your own t-shirt to print onto or purchase a tote bag for £2.50. Get messy creating fun collages and craft with Charlie Kirkham using recycled and coloured paper. What picture will you create? Arts Market. Original prints and pics, arts and crafts and illustrators will be selling their wares. A fantastic selection from local artists. Chromahunt will be on the piazza running drawing activities inspired by the Autumn Equinox and outer-space orbits. All ages are welcome to join in creating colourful Stonehenge sketches and try unusual techniques on the Equi-tension drawing device. Meet Wimbledon Art Studios and enjoy Have a Go workshops! Learn how the pros do face paints, and come away painted as your favourite autumnal animal. Create ceramic miniatures with Go Create inspired by Wimbledon park life. Will we spot many hedgehogs, foxes and squirrels amongst the models?! The Launch of Wimbledon Bookfest! Celebrate 50 years of Alice in Wonderland with the Bookfest team and enjoy books, books, books! WATCH OUT! Who is this creature so big, bad and strong?! The Gruffalo! Spot him around Wimbledon. Join Polka theatre in The Artshed for the beginning of an enchanting adventure, as Polka celebrate their magical winter production of Beauty & The Beast with themed activities. Wimbledon Library! Meet the librarians from your favourite library and enjoy reading your favourite fairy tales. Recently, Wimbledon has welcomed some of the top burger bars in the UK with Five Guys and the independent Dip & Flip opening. The high quality burger establishments provide hand crafted food and local ales and are a popular choice for residents, theatre goers and shoppers alike.